and please excuse the mess. This site is intended as a record. A record of the experience and lessons learned, joyous moments with interspersions of terror, worry, and sleep deprivation, that all come from being a stay-home father. I’m Eoin, a 41-year-old ‘recovering’ journalist, designer, and artist. Most importantly I, like many of my peers, am a father. 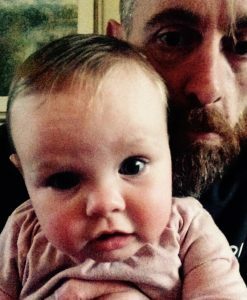 A father to Amelia, a blonde, blue-eyed font of amazement, wonder, and love (while also being a producer of icky fluids and Everest-like mounds of laundry). But I find myself to be somewhat of a rarity amongst men my age, in that I’m a dad who stays home. It was never something I had aspired to be or planned for. But when my wife’s maternity leave ended and I had called time on a newspaper career to retrain, it seemed like the sensible option. I hadn’t realised however, that I’d be training to be a full-time carer, botty wiper, puke soaker-upper, so that artsy master’s degree seems like something of a vanity project now. And yet, here we are. 18 months into this new, all-consuming career. The hours are terrible, the pay negligible, and the boss is prone to wild mood swings and incontinence. But oh my, in spite of all that, and the sneaking suspicion that everything I own now smells vaguely of poop, this is the best, most rewarding job I’ll probably ever have. I probably should have put all this down long before now but hey, I was busy and so, so tired. I’ll use this space as a venue for anecdotes, advice, experiences, pictures, and videos that will try to reflect the life of a stay-home dad. Maybe someone will find it interesting, or even useful, we are few and far between. Oh, and it looks like you’ve sat in something. That’s yoghurt I think (I hope), don’t worry, it’ll sponge right off.